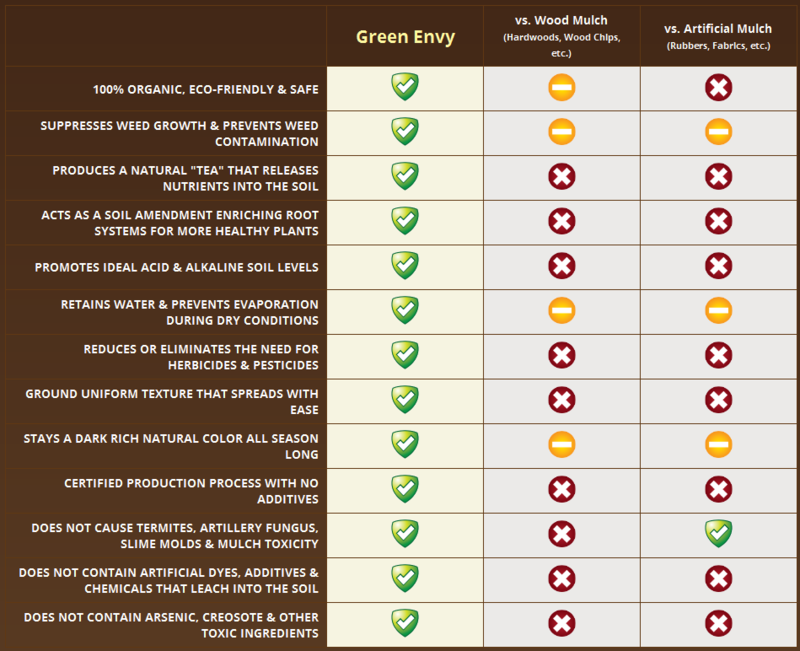 Green Envy 100% Organic Premium Mulch is developed using a certified production process and a non-toxic proprietary formula that contains zero artificial additives, chemicals or dyes. Unlike traditional wood mulches, our premium formula naturally produces an organic “tea” that releases rich nutrients into your soil, while retaining moisture and suppressing weed growth. Green Envy is beyond any basic mulch, it also acts as a soil amendment and can be used in all flower, fruit and vegetable gardens reducing or eliminating the need to add herbicides, pesticides or chemical fertilizers into your landscapes and gardens. 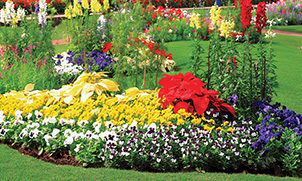 Green Envy Protects and Enhances Your Landscape. 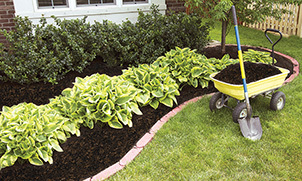 Once spread, our premium mulch instantly improves tilth, suppresses weed growth, increases pH and instantly beautifies your gardens, trees and borders with unique twice ground texture and rich all-natural color. Our certified process ensures a consistent and premium product. 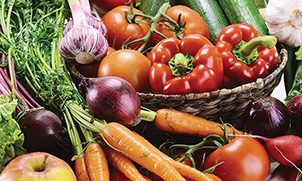 Green Envy Replenishes and Nourishes Your Soil. Unlike traditional wood mulches, the composted agricultural manure in our formula produces an organic “tea” that releases desirable nutrients to enrich your soil, nurture roots systems, and inhibit soil diseases — helping all trees, shrubs, flowers and gardens grow greener and healthier. Green Envy Conserves Your Natural Resources. Our mulch requires less care and watering than traditional mulch. It seals in moisture, reduces evaporation and preserves your watering resources during dry conditions. At the end of each season it naturally composts back into the earth — eliminating the need to remove, or turnover. Green Envy is beyond any basic mulch.  Its additional benefits include soil enrichment ground enhancement, growth promotion, and water retention. As the top layer of Green Envy dries out, moisture is locked in, preventing evaporation. It also acts as a natural sponge to absorb, retain and slowly release water, benefiting optimum growing conditions.